The ITC chain is known for its perfection, so it comes as no surprise that ITC Foodsa�� newly launched range of luxury chocolates, Fabelle, has been close to a decade in the making. Currently available exclusively at ITC Gardenia, the delicate creations are housed at a specially created chocolate boutique, designed by a Bangkok-based design house, wea��re told. Created to look like chocolate bars, the brown walls wear a luxurious look, interspersed with golden accents to lend the space an added touch of elegance. Fibreglass cocoa pods in varying shapes and sizes are placed around the boutique, alongside some of their most exquisite creations. The chocolate is sourced from all over the world, including locations like Ghana, Ivory Coast, Madagascar and St Domingue. With an extensive range of exotic treats, you best ease into sampling their offerings with the smooth ganache, available in two variants a�� Rich Dark and Creamy Milk. Apart from the ganache, some of their other creations that come in gift boxes are Elements, a selection of five pralines taking their inspiration from the elements of nature, and As You Like It a�� chocolate cups where you can choose the casing, filling and topping, or go with the chefa��s recommendations. Of the pralines, we sampled Fire a�� a decadent mix of white chocolate mousse, Ancho chilli and candied mango encased in a dark chocolate shell. Highly recommended by the chef, Ruby Islam, is Water, which features a dark chocolate mousse with acacia nectar and a sprinkling of French sea salt, in a dark chocolate shell. For those whoa��d like to experiment with flavours and combinations, the chocolate cups come as ideal treats. The cups themselves are available in dark and milk chocolate variants. Once that is chosen, one can choose the filling (with options like caramel and berry preserve), and finally, the topping (cocoa nibs, almond slices and more). Infinitely more indulgent and perhaps not the best for your waistline are the Entremets. The desserts are the chefa��s interpretation of traditional favourites. So youa��ll find a tiramisu-inspired entremet with espresso ganache, coffee jelly, coffee streusel and mascarpone cream; and Ghana milk chocolate mousse with caramel and banana creme a�� a nod to the hearty banoffee pie. While there are a wide selection of other desserts, such as Eclair Venezuela, Premium almond and coriander praline tartine, and Warm chocolate tian, one must not miss the interesting line-up of beverages a�� from the Sao Tome Classic Hot Cocoa (single origin SA?o Tome 70 per cent dark chocolate with Lankan cinnamon and black pepper) to Spiced Hot Chocolate (a pinch of garam masala with single origin, 67 per cent dark Madagascar chocolate). a�?Wea��ve just scratched the surface. 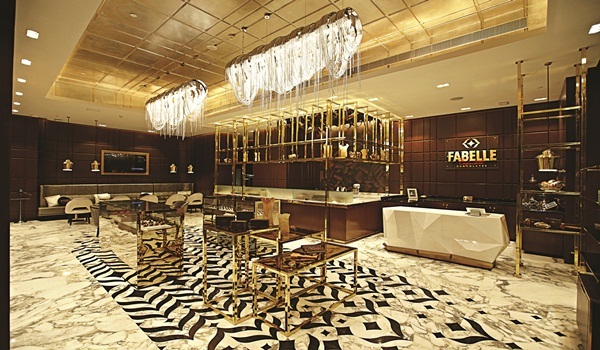 Therea��s a lot more to come from Fabelle,a�? says GK Suresh, executive vice president, new category development at ITC Foods. The boutique will opens it doors in metros like Chennai, Mumbai and Delhi in the next three months. Rs 400 upwards. At Residency Road.